Written by Travel Excellence The ex Brazilian president Luiz Inácio Lula Da Silva visited Costa Rica this past week trying to find a new relationship with the Central America country as well as learning a little about the costa rica culture and the costa rica government. Lula met with ex president Oscar Arias and his brother Rodrigo Arias to discuss several issues amount the two nations. I’ll bet Da Silva stayed in one of the amazing 5 star hotels in costa rica. “They already jumped to be in the elite nations around the world”, said Arias about Brazil. The corporation that now owns Lula Da Silva wants to get the rights to make the road to get from Limon to San Carlos and it cost about $52 millions. "They showed that one can get ahead; they achieved with tenacity, a fundamental change in the Brazilian economy," said Rep. Alice Fournier, from Liberacion Nacional. "The most important of what he said, without going into details of trade liberalization, the most important thing is that a country can achieve out of economic lethargy, all we need to do is redistribution of the wealth. In Brazil, during his government, he brought 28 million people out of poverty”, Fournier added. 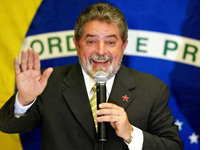 Lula said that the Central America countries need to get together in order to compete and be in touch with the rest of the world; only helping each other they will be elite nations. "It took 500 years to make the first bridge between Brazil and Bolivia", he said. “I don’t want Brazilian companies to come and buy Bolivian companies, but are associated to generate more jobs," he explained. Lula will leave to Mexico after visiting Central America; too bad he didn’t check out thebest costa rica tours to find more out about Costa Rica’s tourism and the great thing you can discover in this country.